Kathleen Budge brings a blend of 26 years of practical experience as a teacher and administrator combined with a decade of work dedicated to bridging the gap between the university and the teaching profession. She is co-author of the award-winning, best selling book Turning High Poverty Schools Into High Performing Schools (ASCD, 2012), and an associate professor of Educational Leadership at Boise State University. Her consultancies include state departments, boards of education, state and regional service providers, as well as school districts throughout the US. Dedicated to improving educational outcomes for all children, particularly those less advantaged, she has been instrumental in the acquisition of nearly 10 million dollars in grants and contracts to advance this aim. Kathleen has led the development of two innovative, non-traditional leadership preparation programs during her tenure at Boise State. The purpose of both programs is to develop leaders who have the commitment and capabilities to lead schools and school districts where all students succeed. From 2011-2015, she was co-director of the Idaho Leads Project, the goal of which is to strengthen leadership capacity in Idaho’s K-12 schools and districts and enhancing the advancement of educational improvement in Idaho’s communities. Prior to joining the faculty at Boise State, Kathleen served as the Assistant Superintendent for Teaching and Learning at Educational Service District 113 in Olympia, Washington. She provided leadership to forty-five, predominately rural, school districts serving approximately 77, 000 student, leading the development of a highly successful regional job-embedded professional development model. In recognition of her leadership, she was awarded the Washington Association of School Administrator’s (WASA) Regional President’s Award, the WASA Award of Merit, and the Washington Association of Educational Service Districts President’s Award. 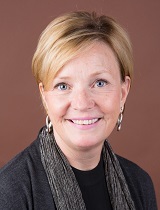 Kathleen earned her doctorate from the University of Washington in Educational Leadership and Policy Studies in 2005. She was selected to participate in Leadership for Learning, an innovative, cohort-based program that emphasized the link between leadership and learning, as well as the development of leaders willing and able to address and redress issues of equity and social justice. She considers her most important work to date to be teaching first graders to read. Also available to co-present with her co-author William Parrett. Some teachers are more successful with students who live in poverty than others, but what is the difference? Studies show it goes well beyond the curricula selected, teaching strategies employed or quality of the instruction. While all of these factors are important, they are insufficient for explaining the difference. Key to succeeding with students who live in poverty is the way in which teachers relate to them and engage them in the learning process. In this session, participants will learn how to develop classroom cultures in which both they and their students thrive. 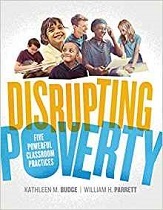 What does it take to disrupt poverty's adverse influence on student learning? It requires far more than individual teachers' diligent and often heroic efforts. Even when successful, these endeavors are rarely replicated or sustained without far broader and deeper collective action.Based on the award-winning ASCD book, Turning High Poverty Schools into High Performing Schools, co-author Kathleen Budge, will provide participants with a protocol for collaborative action. Practical strategies and concrete examples of how those strategies are implemented in high performing, high poverty schools, are intended to "jumpstart" participants' thinking about what it often takes to successfully engage students who live in poverty in the learning process and create a learning environment where all students succeed. Is it possible for high-poverty schools to be high achieving? Of course it is! Real schools with students living in poverty do post high levels of student achievement. Learn what these schools do to help students succeed-and how you and your school can adopt the same practices-no matter what socio-economic climate students live in. Lessons learned and practical advice from seven of these high-performing, high-poverty (HP/HP) schools, along with hundreds of others that have been the subject of intensive research, are the focus of this book. Authors William Parrett and Kathleen Budge have synthesized the research, studied the schools in depth, and show you critical components that set these institutions apart from their struggling peers. 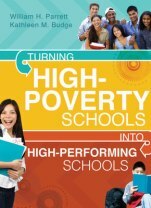 After setting the context by examining poverty and its stunning effects on students, the authors then zero in on what HP/HP schools stopped doing or eliminated and what they started doing or improved on in three key areas of performance: Building leadership capacity; Fostering a safe, healthy, and supportive learning environment; and Focusing on student, professional, and system learning. Principals, teacher-leaders, and district leaders can benefit from the real-world examples and practical guidelines, all based on research and experience. Rather than suggesting a one-size-fits-all approach, the authors acknowledge the unique context of individual schools and urge readers to engage in self-assessment, reflection, and coordinated action to learn together and lead together, with rubrics and planning templates provided to guide the process. The reality is that any school willing to refocus its efforts can become a high-performing school.